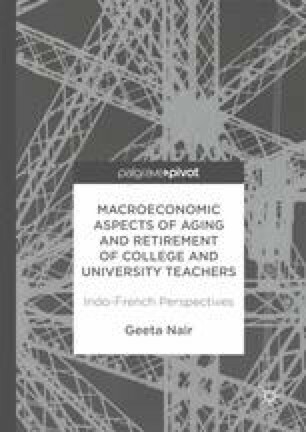 In this chapter, we focus on aging and retirement in France, particularly among college and university teachers. Both the nations highly respect this segment of workers as teaching is treated as a noble profession that plays a huge role in molding young minds and thus shaping the nation’s future that affects an eternity of generations. We shall first discuss the general trends as they include the segment of our chosen sample of college and university teachers, beginning with France and proceeding with India in the later chapter. One key issue in pension reform debates is the labor supply elasticity of older workers. It needs to be seen to what extent are older workers able or willing to work longer careers as full retirement age and marginal incentives to work increase. We estimate this key parameter using the 1993 French pension reform as a natural experiment and draw implications for the likely long-run effects of the 1993 and 2003 reforms.